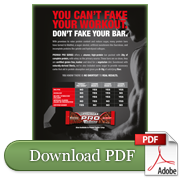 Promax added an even higher protein bar to their line – the Promax Pro Series bars. People who are serious about strength training and bodybuilding are welcoming this bar, that can easily replace a protein shake, even a meal for some weekend warriors. With Whey Protein being the primary source, you’ll also get a great nutritional profile with no artificial sweeteners, gelatin or maltitol. INGREDIENTS: Protein Blend [Whey Protein Concentrate, Whey Protein Isolate, Whey Crisps (Whey Protein Isolate, Whey Protein Concentrate, Tapioca Starch, Calcium Carbonate, Soy Lecithin), Casein, Hydrolyzed Whey Protein Isolate, Whey, Calcium Caseinate], Brown Rice Syrup, Soluble Corn Fiber, Soy Protein Isolate, Glycerine, Cocoa Crisps (Soy Protein Isolate, Alkalized Cocoa, Tapioca Starch), Alkalized Cocoa, Sugar, Invert Evaporated Cane Syrup, Fractionated Palm Kernel Oil, Canola Oil, Unsweetened Chocolate, Natural Flavor, Ground Almonds, Cocoa, Salt, Nonfat Milk, Soy Lecithin, Stevia Leaf Extract (Reb A). 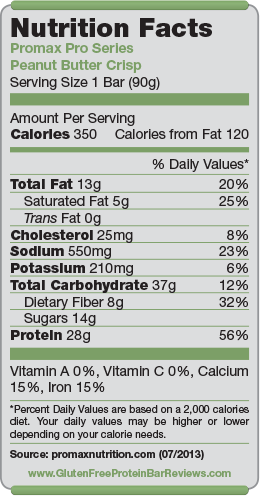 Nutrition facts based on Peanut Butter Crisp flavor. Facts and ingredients vary by flavor. We care about what goes into people’s bodies, so we pack our bars with replenishing protein, vitamins and minerals, and great-tasting flavors. You won’t find any artificial sweeteners or preservatives, high fructose corn syrup, trans fats, maltitol or gelatin, and they are gluten-free, kosher and vegetarian. 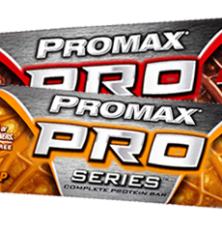 Promax Pro Series bars have 350 calories, which might seem high, but this is a 90 gram bar. If you compare it to bars that are half the size, they usually have more than half the calories than this bar. After a series of Promax bars with 20 grams of protein or less, serious athletes and people, that look for a protein shake replacement in form of solid food, now have an even higher protein option with the Promax Pro Series. All the reviews that we looked through to get a feel of other people’s taste buds have been nothing but positive. Buyers really liked the taste, especially from the Peanut Butter Crisp flavor. 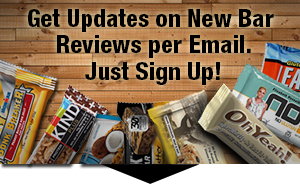 They mentioned it tasted almost like a candy bar, but with a way better nutritional profile. Buyers liked the crunchy texture of this bar due to the protein crisps. The Triple Chocolate Crisp got a little harder especially after being in the fridge, while the Peanut Butter Crisp has the perfect texture according to other testers. Carbohydrates are pretty high, although only 14 grams of it is sugar, which is relatively low for that size of bar. We’re talking about a 90 gram bar with 28 grams of protein here. Buyers appreciated the use of stevia to lower the total amount of sugar instead of using artificial sweeteners. The amount of fiber (8 grams) is above average compared to other bars in this category. Contains Palm Kernel Oil, which is a cheaper alternative to cocoa butter. With 28 grams of protein a bar is expected to cost more, so $3.75 at retail price does not surprise us. Protein is expensive and this bar for sure has a lot of it. One Promax Pro Series bar could easily replace a meal for some people.